With the advent of summer, powder caking is a problem for many manufacturers. In addition to the process problems in the production process, storage and transportation are factors that affect the final spraying results. In summer, the temperature and humidity is high, and directly affect the final coating quality of the powder coating. The first is the effect of temperature, powder coatings must maintain their particle size in order to operate and use. Most thermosetting powder coatings are formulated to withstand a certain amount of heat during storage. Heat resistance varies by type and formula, but as a general rule, the temperature must not exceed 30°C. If the critical temperature is exceeded, one or all of the following physical changes may occur, regardless of the length of time. The powder may sinter, clump, or clump in the container. The weight of the powder on its own (ie, a large and tall package may accelerate the powder clumping and caking at the bottom ). Unless the heat is too high or heat is applied for a long time, powder coatings that undergo such changes can usually be broken up and then recycled by sieving or recycling. Powders with fast or low-temperature curing characteristics may undergo chemical changes due to excessive heat. These powders may partially react chemically. 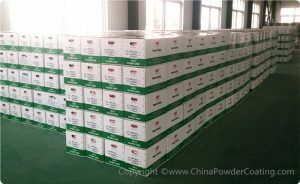 Although these powders can also be broken, they will not provide the same flow and appearance characteristics as unheated powders. The fluidity of these powders will be limited, not reversible, and may even become dry tissue. Second, powder coatings for dry powder spraying cannot be mixed with water. Exposure to excessive humidity may cause the powder to absorb moisture. This will result in powders that are difficult to handle, such as poor fluidity, and poor use of the spray guns, which in turn may cause the spray guns to splatter, eventually melting due to impact, causing plugging. Excessive moisture content will certainly degrade the electrostatic properties and may change or reduce the transfer efficiency. In severe cases, it may also affect the appearance and properties of the cured coating film. special products must be refrigerated and stored in air-conditioned or refrigerated compartments. Finished stock shipments need to be checked and grouped in accordance with standard sampling in advance. After OK, the goods can be shipped. After sifted, they can be delivered. According to the transportation time and product requirements, choose the transportation method, use dry ice, air-conditioned vehicle or night transportation.